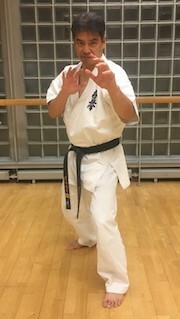 The London Dojo Kyokushin syllabus provides a clear pathway for students to learn and improve. Grading examinations are held in June and December. A minimum of 80% attendance from the previous grading. Competence in all aspects of the syllabus for the level required. Completion of a written test with 100% score. Students must submit their application form, license book and grading fee before the grading date to be eligible. Begin the count - 'ichi, ni, …' leaving time inbetween counts for the class to perform their technique. The numbers of the count represent an attack. As such everyone should respond with their technique between the count - not on the count. Below are the questions you can expect at the written test. The written test begins at 9:15 and ends at 9:45 at the grading venue. Students are required to pass the written test with a score of 100% to enable them to participate in the skill test. There can be no proof without real fighting. Without proof there is no trust. Without trust there is no respect. All London Dojo policies and procedures are available to view on request.